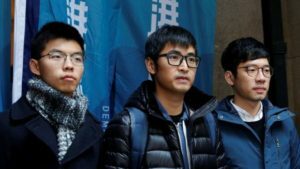 Three leaders of Hong Kong’s pro-democracy movement vowed to continue their fight after their sentences were reversed by the Chinese-ruled city’s Court of Final Appeal on Feb. 6. Pro-democracy activists, from left, Joshua Wong, Alex Chow and Nathan Law. In a unanimous decision, a panel of five judges cleared Joshua Wong, Nathan Law and Alex Chow. The three activists had been charged with “unlawful assembly” after they and others stormed into a fenced-off area in front of government headquarters in September 2014. The protest sparked the “Umbrella movement,” which pushed for full democracy in Hong Kong and brought parts of the city to a standstill for three months. “It’s not a time for celebration … It’s a long term battle for us in the future,” said Wong after the Feb. 6 verdict. The five judges, including a non-permanent foreign judge, Lord Leonard Hoffmann, said in the judgment that they had “quashed the sentences of imprisonment” by the Court of Appeal, Reuters reported. The judges also warned that “future offenders involved in large-scale unlawful assemblies involving violence” will be subject to stricter guidelines by the court. “Maybe more and more activists will be locked up because of this harsh judgment … We must urge people to continue to fight for democracy,” Wong said.